In a previous article we used the US-100 ultrasonic sensor in pulse width mode, consisting primarily of sending a first start pulse and measure the pulse width of return. The problem of this mode of operation is that fails to take advantage of the characteristics of this sensor, which is able to compensate its calculations from room temperature. In this article we will study the behavior of US-100 serial mode. The serial mode for this sensor is set up via jumper. So, we will ensure that the rear jumper is closed. In this mode, serial communications take place via those pins marked as Tx and Rx, which would be connected respectively to the transmit and receive pins of our Arduino. The serial port is configured as 9600 8N1. As you can see in the figure, we connect pins 2 and 3 with the pin “trigger / tx” and “echo / rx” the US-100. The US-100 also requires that the two pins “GND” are shorted and connected to GND in Arduino. Notice that we use the library SoftwareSerial in order to enable pins 2 and 3 as a new serial port for our Arduino. 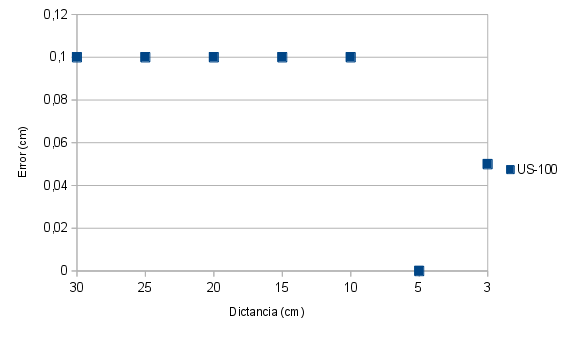 Otherwise, the code simply sends commands on distance measurement and temperature, showing the results. It can be seen that the measurement error remains within the manufacturer’s specifications. For small distances the error becomes negligible. 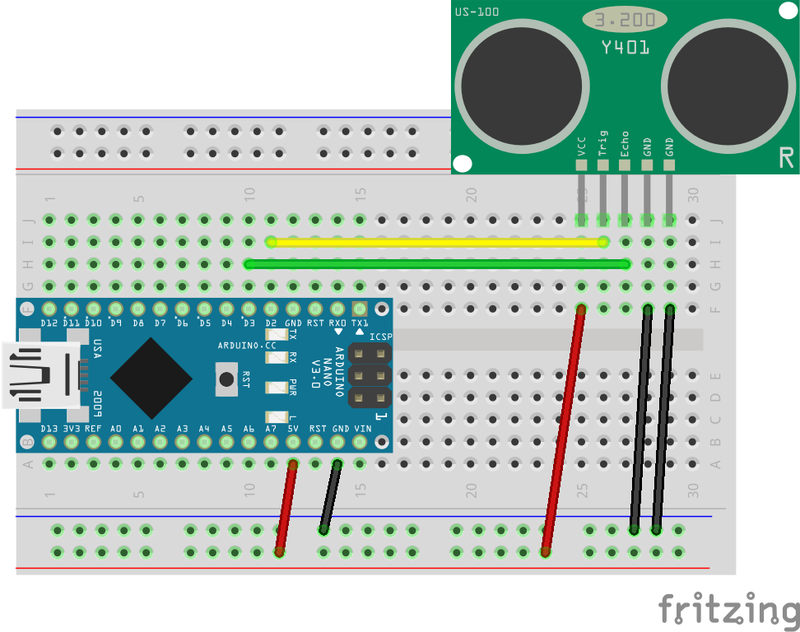 This entry was posted in Arduino and tagged Arduino, distance sensor. Bookmark the permalink. In this review are you saying that in serial mode the US-100 gives drastically better accuracy? 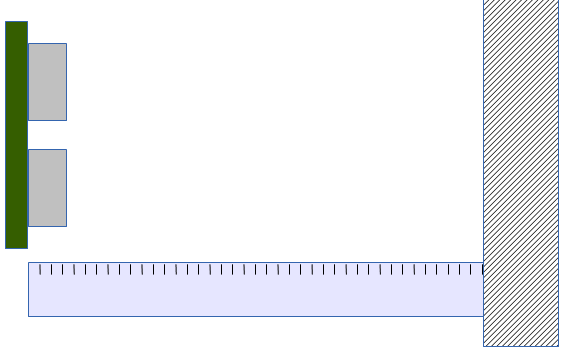 The max error is “0,1 cm” – is that 1mm? If so, do you think that is because the temperature compensation is coming in to play? Was this test done with the same unit from the previous test? Temperature compensation is very important to improve the accuracy but, in this case, it’s even more important the fact that the calcs are made by the same sensor and not the Arduino. I’ve got a US-100 now and the results are impressive. I’ve got it sat at a distance of 672mm from the floor, fixed to my desk pointing downwards. Using it in the dumb mode (ie. sending ping, measuring echo) I see the measurement is much higher than it should be (~795mm, so 123mm). I also see much more variability in the numbers – from 792 to 798mm. Using it in the serial mode I see the measurement is both more accurate (672mm exactly) and far more stable (it barely changes, occasionally I’ll see it jump up by 1mm). The stability isn’t as simple as the US-100 faking it by doing some smoothing on the values it returns – fetching readings every 100ms, if I wave my hand past the sensor I will see one lower number with perfectly accurate readings either side, so it responds quickly. This backs up all your findings I think, and shows how much better the US-100 is over the more basic models. 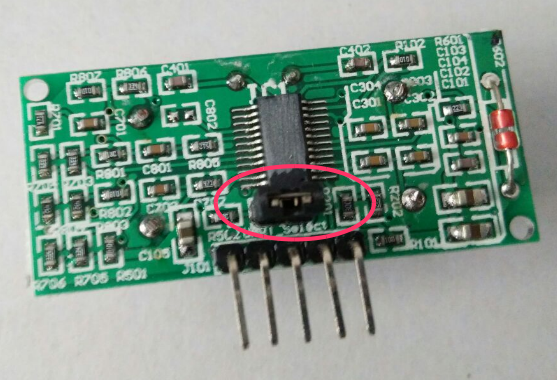 1) it is a different size to the HC-SR04 (board is ~1mm less long, so the mounting holes are at a different distance, and the ultrasonic tx/rx devices have a different separation). Only bad if you wanted to use this as a drop in replacement where you have an existing housing or mounting to fit it to. 2) The serial data returned is rather dumb, so it wouldn’t be hard to trip up – specifically the data returned doesn’t identify what it value it is returning (or which byte is the start value). This would be more of a problem if you wanted to get distance *and* temperature readings – otherwise you should be able to avoid problems with some heavy handed pauses to get in step with the US-100’s output. Update to my last post: there was a bug in the test using trigger/echo mode, that meant the result was scaled by 57/50. This means it was returning a value of (795 * 50 / 57 = ) 697mm. So it is still overestimating the distance, but by more like 25mm. The comments about variability still stand (6mm from lowest to highest reading). Ages ago I wrote a library for using US-100 in serial mode, I’ve finally put is somewhere so others can benefit. Mentioning here as I figured people might come across this page when they are investigating what to buy. Pingback: My Swimming Pool project | How can I help you? ¿Qué hacer cuando TomTom Sports Connect cae cada vez que se inicia?